1989. Lives at H.J. Carroll Park, Chimacum, WA. Walk-in salmon. Fiberglass. 25-feet long. 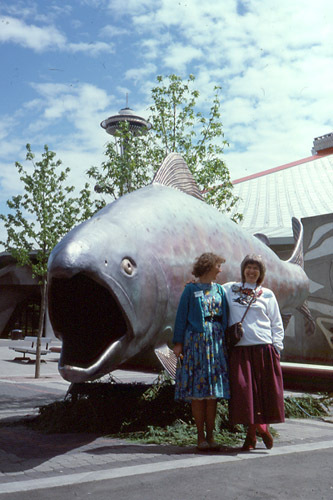 Design and artistic direction of many aspects of the 25 foot collaborative fiberglass salmon, including sculpting the head, design and directing execution of painting inside and out. (Altogether, an estimated 30 people worked on this creation). Inside depicts all creatures of the Riparian Zone. Fin has traveled all over the North American continent on its own specially designed trailer.